The CADLive: D80 represents a durable, easy to place design possessing a unique sound profile. "When reaching for an inexpensive mic to throw on a guitar cab for a nice classic slightly scooped American guitar tone, the CADLive D80 is my first choice. The super-cardioid pattern brings in just enough sound from the back side of the capsule to introduce some roomy tones while still maintaining a close, clean, and crisp guitar sound." 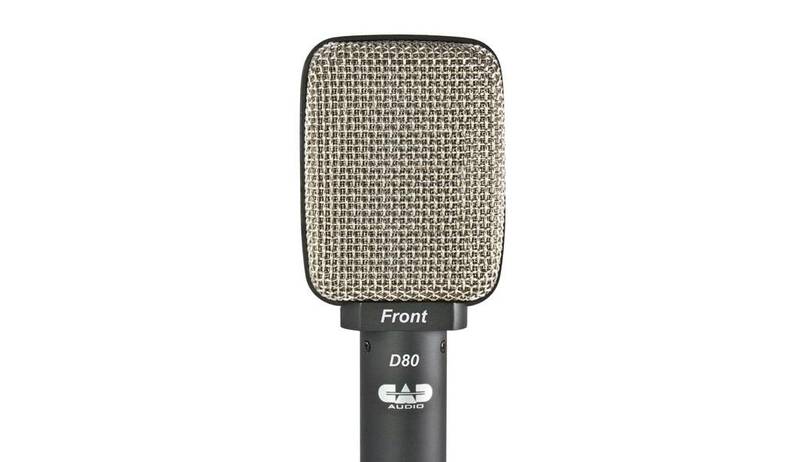 The CAD D80 super-cardioid microphone represents a durable, easy to place design possessing a unique sound profile. Used individually the CADLive D80 may be used to create the custom sound you wish from your guitar cabinets and percussion. D80 is a Large Diaphragm Moving Coil Dynamic that delivers a reminiscent, yet updated sound profile you would look for in a dynamic microphone. The CAD D80 super-cardioid microphone has a tight Super-Cardioiod polar pattern while supplying a hot output — ensuring outstanding performance on even the loudest stages.